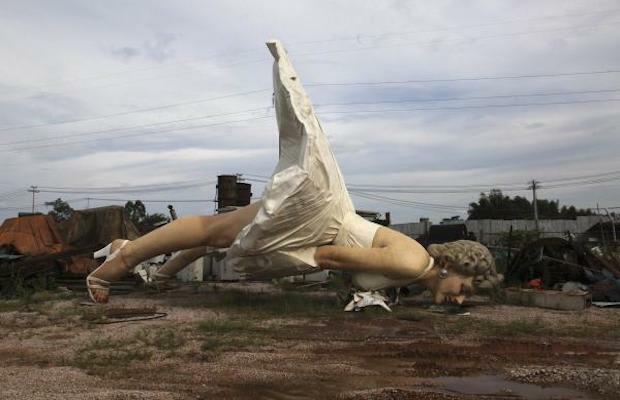 After standing outside of a business center in China for six-months, a 27-foot-tall stainless steel sculpture of American pop culture icon Marilyn Monroe was dropped off at Guigang dump site this week, but no one knows why. The nine-ton statue depicts the actress in her famous "wind-blown skirt" pose from the film The Seven Year Itch. According to NBC, the statue was made by "several Chinese artists over two years," but as Hyperallergic points out, it does bear a striking resemblance to another sculpture titled Forever Marilyn, created in 2011 by Seward Johnson and currently on display at his retrospective in Hamilton, New Jersey. It is unclear why the replica was made, why it was trashed, or what will happen to it next, but we wouldn&apos;t mind scooping it up and installing it outside of the Complex office if no one else will take it.